Give your students a chance to learn how much fun it is to write poetry and meet a real, live poet, too. 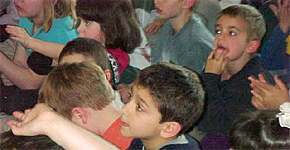 The Poetry Lady, Denise Rodgers, will come to your school and get everyone excited about reading and writing poetry. This is perfect for upper elementary students. Students will enjoy a poetry reading and a skit before they launch into their poetry-writing experience. Using themes from her Great Lakes Rhythm & Rhyme book, The Poetry Lady will lead the group in writing a poem which will be published on this web site in the Kids' Poetry section. Students will also be encouraged to email their individual poems to the site so they can be included on the same page as their school's group poem. If you have questions, send an email to Denise Rodgers at drodgers@thepoetrylady.com or call Creative Writing Press Inc. at 1-800-760-6397. 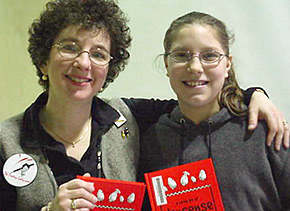 Denise Rodgers with Brittany, an enthusiastic young writer she met during a school visit. The Poetry Lady brings her music and puppet and gives the students a lively poetry reading of some of her favorite selections from both "Great Lakes Rhythm & Rhyme" and "A Little Bit of Nonsense." 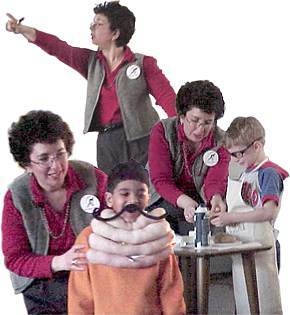 Volunteer students will have a chance to dress in costume and act out some of The Poetry Lady's favorite creations.Poetry Lady Visits are perfect for lower elementary students or for whole-school visits up to 6th grade. Students will also enjoy a group read-along poem as part of the Visit. The Poetry Lady will also play a few songs written and produced to go along with her poems by her son, David Rodgers. All students (even the youngest ones!) who have an opportunity to participate in The Poetry Lady's visit will leave with a new understanding and appreciation of the creative writing experience. They will be encouraged to become creative writers themselves by writing in journals and saving all the funny ideas and things that happen in their lives. 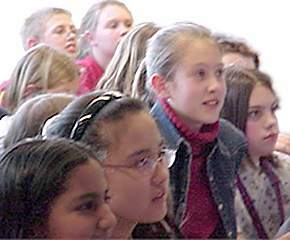 Read Letters from children who have attended a Poetry Lady presentation.